Ma Dame, croyez-moy, sont choses monstrueuses. Et qu’en prenant la glace et la neige on se gelle. Sinon d’un grand brasier, aumoins d’une etincelle. Believe me, my Lady, these are monstrous things. Little spark of Love, even if not a great bonfire. Blanchemain’s version is identical: no need for change here! Aumoins s’il n’est ainsi, trompé je le pensoye. Et que l’absence engendre au double le servage. Je suis content de vivre en l’estat où je suis. Je deviendrois tout fol, où je veux estre sage. Which had begun just a little to show itself in you. Even if it’s not true, I am mistakenly thinking it. And that absence gives birth to a double servitude. I would become completely mad when I want to be wise. Goodness – Helen has begun, Ronsard thinks, to show some slight interest and affection; and then of course immediately gone away… Such are the lover’s misfortunes! 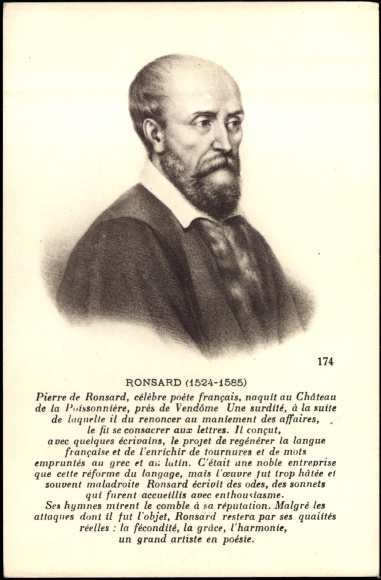 Although the material is conventional, Ronsard manages to conjure some complex and contradictory aspects, which lend the poem an air of a more solid truth behind the conventions. And of course the opening calls to mind his enormously-popular “Bon jour mon cœur, bon jour ma douce vie” from a much earlier set of love-poetry. Et aux Amours vous me donnez en proye. Me tire au cœur, quelque part que je soye. De mes pensers la fin et le milieu ! A la Deesse il appartient un Dieu. And give me over as prey to Cupid. Has shot into my heart, wherever I might be. Beginning and end of all my thoughts! To this goddess should belong some god. Although this poem has many attractive features, in my view there are some really weak ‘filler’ moments. For instance, why would Troy be burning in ‘victorious’ fire – obviously the fire overcomes Troy, but it requires a sudden shift of perspective to follow. Worse, īthe second half of line 8 has no real meaning,doubly so in the context of the first half: pure ‘filler’. Line 12 – though here I’m niggling – also literally says that Helen’s face is the “end and middle” of his thoughts; even allowing for poetic inversion, I’m not sure ‘middle and end’ is driven by anything other than metre. Well, enough complaining! In other respects a neat, classically-allusive tribute to his fair lady. The references to Troy being burned because of Helen, and to Homer’s frequent mentions of Helen, need no more explanation;bu it might be useful to be reminded that Helen was said to be the daughter of Leda, who was famously wooed by Jupiter in the form of a swan (line 11).